Side view of the bough pot. A view of the cover showing three floral sprays printed around the openings for the placement of flowers or boughs. 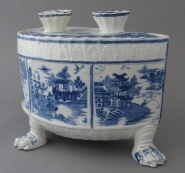 A large molded and footed pearlware bough pot printed in blue with two unidentified Chinoiserie patterns. The two patterns are arranged in four alternating panels that wrap around the front of the pot and the edges are painted in blue. Three molded crocodillian-like feet support the pot. A molded acanthus leaf pattern adorns the gallery and bottom of the container. No pattern is printed on the back.